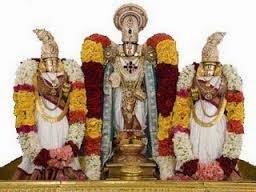 Srivari Kalyanotsavam is performed to the utsava murti of the Lord Sri Malayappa swami and his consorts Sridevi and Bhudevi in the marriage hall in the Sampangi Pradakshinam. Refrence to this Seva conducted on special occasions are found in the inscriptions of the 15th century. The wedding cermony is held amidst recitation of the vedic mantras and pronouncing the family pedigree of the brides and bridegroom. The idols of the Lord and his brides face each other with a screen in between. They are allowed to see each other only at the appropriate auspicious moment when the screen is removed. The priests perform homas. A purohit conducts the marriage and an archaka is consecrated to perform other rituals on behalf of the bridegroom. 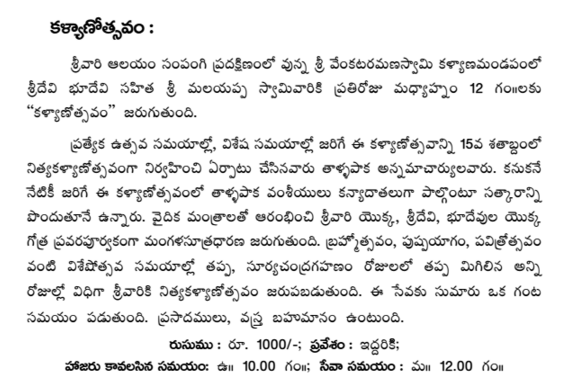 This seva is not performed on important festivals like Srivari Brahmotsavam. Pavitrotsavam, Pushpayagam etc. and on the days of solar and lunar eclipses. The grihasthas who participate in the seva are given prasadams and clothes. The duration of the seva is about one hour. For further details contract our call center:0877-2277777,2233333.